Fishin Frenzy slot is hardly a masterpiece, both in the looks and in gameplay. There’s nothing going on in the main game, and the only thing to look forward to is the free spins round, where a big catch is definitely possible. Just be careful not to blow it all in the gambling feature. Fishin Frenzy slot was brought to you by Reel Time Gaming (not to be confused with Real Time Gaming). The game has a cartoony style, and frankly looks rather boring, but maybe it’s just us. Those of you who enjoy a quiet hour or two with a fishing rod may certainly find it appealing. There are 10 paylines in the game, meaning that the winning combinations are rather rare. It’s not uncommon to have 10-15 “dry” spins. Sure, it kinda resembles real fishing in this, but come on. The only special symbol in the main game is a scatter (Boat), that actives free spins. You’ll also notice different fish symbols with number tags attached, but it only matters in the free spins round. Three or more Boat symbols give you 10 to 20 free spins (depending on the number of symbols that activated them). The Fisherman symbol that appears during the bonus round pulls all the fish from around the reels, adds the values from the tags to you winnings, and becomes a wild symbol. This may lead to pretty large winnings (the bigger fish is worth 50 total bets). As the bonus round ends, you can either collect what you got, or gamble it. The gamble feature is standard - guess the color of the card and double your win (up to five times). If you guess wrong - you lose everything. 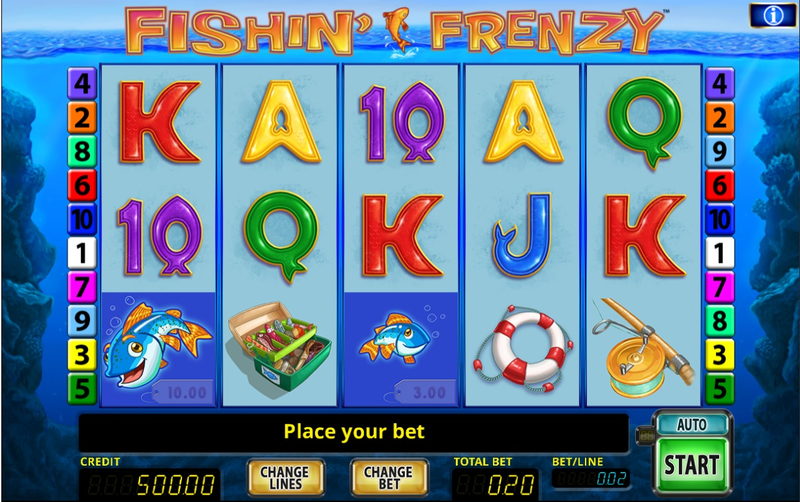 We found Fishin Frenzy slot rather generic. It doesn’t look all that great, and the overall theme is not particularly appealing (not for us at least). The round of free spins is alright though, and can yield a nice catch. Click here to play Fishin Frenzy - you may need all the patience you have though.